I've seen great Real Space Modeling projects in your forum. Therefore I want to point out you on my major project. 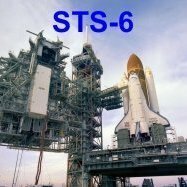 I decided for the STS-6-Mission with the Challenger (04.04.1983) as guidance version for my build, as you can see here in the following image of the Launch Pad 39A with the Challenger before the start to the STS-6 mission. To be built is the Launch Pad 39A with Launch tower, Shuttle stack, as well as Mobile launcher platform (MLP) and Crawler transporter (CT). Basic module for my project is the old Revell kit 4911 in 1:144. In addition of the launch tower FSS I will use the Detail kits of LVM Studios. The LVM kits contain photo etched parts (PE) from thin brass sheet metal, with which very finely detailed structures can be produced as well known. For building MLP and Crawler I use the cardboard-model kits by David Maier from EDU-Craft Deversions in scale 1:144. The kits consist in each case of 13 colored building sheets of cardboard (27.5 cm x 42.5 cm) as well as a building guidance on CD-ROM. If you are interested in the beginning of my progress report you can look here in the ARC Discussion Forums. you can follow my progress report in the NASASpaceflight Forums. Meanwhile I have begun to light my MLP with LEDs. This is an incredible build! I love the way you use a cardboard model as the basis for the build and then add all the details on top! The most recent photos with lighting are astonishing! yep, the ARC link was wrong, as I have noticed just today, sorry. But you can also follow the thread in NSF Forums. BTW, if you or other guys have any feedback or questions, you can also post here and I'll answer you. Only some of the pics with my lighting experiments. you can see here on the middle Access Platform. But according to my taste the cold white light looks pretty unrealistic. Therefore then I've tried warm white LEDs on the left Access Platform, far left Golden White and beside Sunny White, what looks much more better. Meanwhile, I have decided on the warm light of the Sunny White LEDs that I will use. This should only be a small overview for the curious. Location:Sedgefield, South Africa. Africas first Slow Town. Citta Slow. An interesting build, I'l follow with interest. The lighting looks spot on. Thanks Mike and Colin for your nice words, I also think so! The Sunny Whites make a pretty realistic warm white light. Good to see the update on here Manfred, been following this superbly detailed build . I reckon you have another year or 2 before it's finished such is the level of perfection, keep it up. I don't know exactly, fortunately I have no deadline. But I could think more like two years, it has to be with all these details, LVM PE-Detail Kits No. 1-5 and especially lighting. Good luck with your efforts, it's gonna take a LOT to achieve what your aiming for, but on this showing: You'll do it!! Thanks for your kind words and the best wishes, that gives me strength and courage to carry on. Now I've got also the red LEDs (0401), and therefore I have made a first test. These LEDs I want to use for the caution lights (beacons). only they do not blink, but this is also provided. Well, now I'm going to dismount the Pure White LEDs and replace by the Sunny White. And now the lampshades have to get the finishing touch and paint before they go into the electrical workshop. !!! great build so far ! Thanks Olivier for your nice words. and thanks guys for your nice words. After a light spring fatigue I have browsing in the meantime, some older images sources according to the hazard warning lights. But somehow I have not the right clarity, as with these red and/or yellow beacons of those days back in the STS-6 on MLP-2. So far, my friends from the NSF Forum unfortunately could not help me too, but I stumbled across a very interesting thread that makes me high hopes. So I have found a contemporary witness (39B), who has worked at the time during the reconstruction and modification of the Pad 39B there and has been reported about in detail with although partially slightly yellowed, but still great photo scans. Maybe he can answer my special questions. Since I now know the lamps pretty good on the FSS and the MLP, I have now started, the lights on the RSS to look a little closer. And this my standard reference photo is again a good overview. And as you can see it, there are the same lamps are mounted as in MLP with the classic lampshades. On the newer "old" photos the lamp shape becomes even clearer as the following pictures show. And so I can use my recent lampshades from the ferrules for the RSS lamps. Of course I've tried and picked out the lamps from the Revell kit. These are the arc lamps here, of which 40 pcs. are included in the kit, but they were never installed in this spherical shape on the pads. or what do you think? Okay, the arcs are 1 mm in diameter, what's a little too strong, but I would anyway prefer to use a thinner brass tube in order to thread the LED wires still. Yup, like the modified lamps. To get a thinner tube you could use the actual metal tube as the return conductor so that you only have to thread one wire through the tube. this is possible in principle, but should only be very cumbersome. For this I first have to solder every negative pole of the LEDs to the brass tubes and then connect each brass tube by a soldered wire to the next, and that is certainly a major effort. Since it is much easier to pull the two wires from LED through the tube, in this test this is brass tube 0,7 mm in diameter with 0,25 mm wires. You mean this variant, right? First I will try to pull the wires through the tube, maybe it will work.